We’ve written extensively about the UBS Puerto Rico Closed End Funds. These funds were concentrated in the riskiest subset of Puerto Rico municipal bonds – uninsured bonds with little or no market outside of the proprietary UBS funds. Our prior posts on Puerto Rico can be found by clicking here. In this post we revisit the Employee Retirement System’s 2008 ERS Series B offering to highlight Santander’s role in this ill-fated deal. The Series B bonds were the second of three ERS offerings. The first, in January 2008, raised only $1.6 billion of the $4 billion contemplated for the 2008 A offering. In January 2008, the Retirement System still contemplated selling $4 billion more POBs. The Offering Circular for the $1,058,634,613 2008 ERS Series B was published on May 28, 2008. See Figure 1. Notice that the underwriters were just UBS FSI of Puerto Rico, Santander and Popular down from the twelve underwriters who participated in the Series A offering. Something dramatic happened between January 29, 2008 when the 2008 Series A bonds were issued and May 28, 2008 when the 2008 Series B bonds were issued. The issuer and underwriters of the Series A bonds committed to finding a market outside of Puerto Rico for the Series B bonds. See Figure 2. Rather than only being sold in the non-Puerto Rican market place as promised four months earlier, the 2008 Series B ERS bonds would only be sold to Puerto Rican residents. See Figure 3. 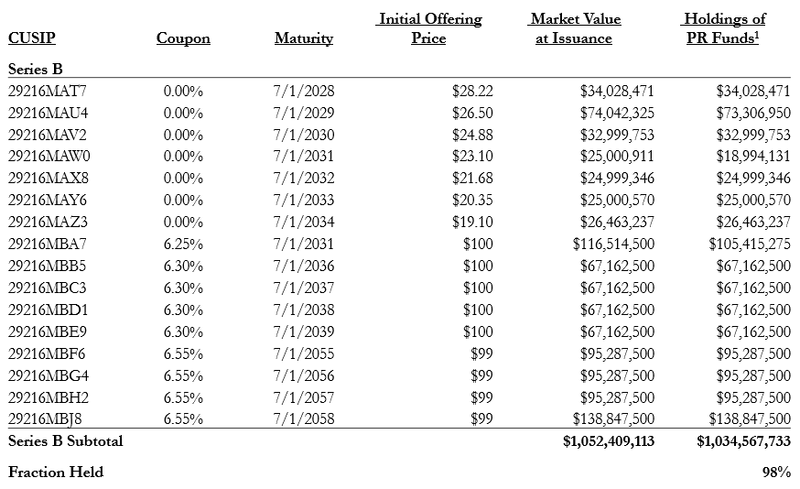 There was no market outside of Puerto Rico for the ERS 2008B because the yields the Retirement System could pay on the bonds and hope to earn an interest arbitrage were insufficient to compensate for the risk of the bonds. This was material information about the riskiness of the ERS bonds for investors in the Series B bonds and holders of the Series A bonds but was not highlighted in offering circular. Not only was there no market outside of Puerto Rico for the Series B bonds on the terms they were being offered, there was no market for the bonds on the island either. As we previously reported UBS bought 89% of the 2008 Series B ERS bonds into its proprietary funds. See Figure 4. Recently we examined the holdings of Santander’s closed end funds and found something very interesting. 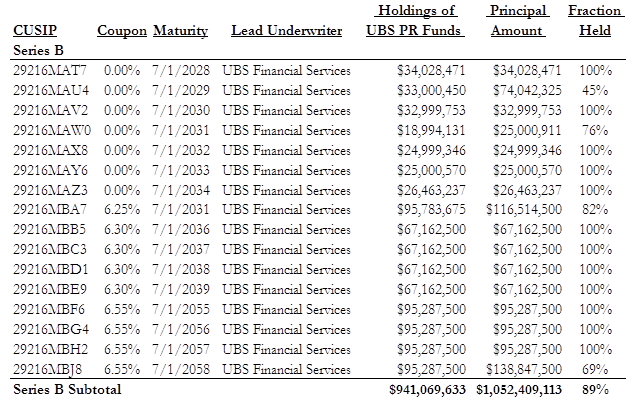 Virtually all of the Series B bonds that were not bought into the UBS solely managed funds and funds co-managed with Popular were bought into the Santander funds. We are missing the holdings information for a few funds and so it is quite likely that 100% of the 2008 Series B bonds were bought into the funds controlled by the three underwriters – UBS, Popular and Santander. See Figure 5. UBS, Santander and Popular paid about $99.20 on average for the bonds. UBS, Santander and Popular resold these bonds, which it paid the Employee Retirement System approximately $1,043,106,980 in the when-issued market to its proprietary mutual funds for $1,052,409,113. UBS, Santander and Popular charged its mutual fund investors approximately $9,000,000 markup over the price they paid the issuer in what was, economically at least, a riskless principal trade. This was a 0.80% markup on $1,052 million in institutional purchases. Breen, Hollifield, and Schurhoff (2006), available by clicking here, find the average underwriting spread on municipal bonds is 0.8% and that more than half of this spread is provided to the brokerage firm as a sales credit or gross commission to motivate the sales force. They also find that a significant fraction of large trades are done below the reoffering price at the time of the offering. There were no retail brokers to compensate for selling these Series B bonds since they were bought by proprietary funds controlled by the underwriters directly from the underwriters yet UBS, Santander and Popular charged their mutual fund investors to whom they owed a fiduciary duty an additional $4.5 million over the average $4.5 million underwriter spread on this 2008 Series B which would have been roughly the average non-sales credit component of the spread. Thus UBS, Santander and Popular paid the Employee Retirement System millions of dollars less than they should have or UBS, Santander and Popular caused their mutual fund investors to pay millions of dollars too much – or both. 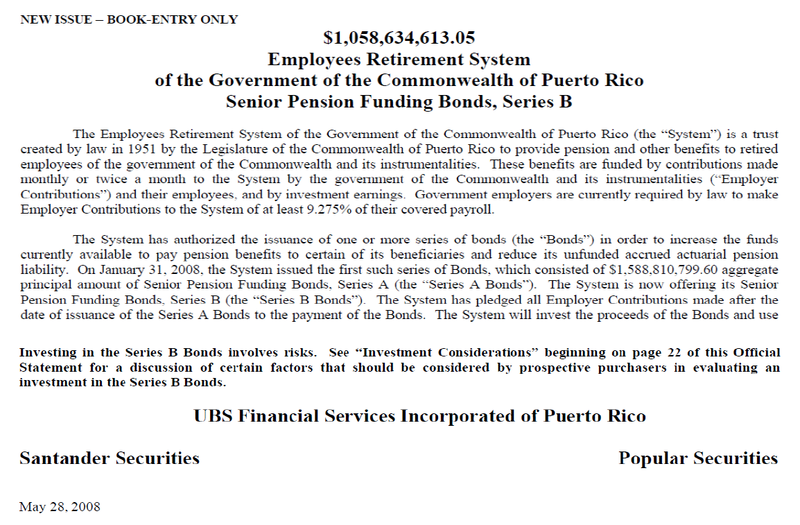 As we have said before, the most interesting non-public documents in the Puerto Rico municipal bond fund saga will likely be the internal emails and memos at UBS, Santander and Popular and the communications between UBS, Santander and Popular and the Retirement System as they realize that there was no market for the 2008 Series B bonds and the 2008 Series A promise that the Series B bonds will not be sold on the island had to be abandoned. Someone should be looking into this.